Click on the map below to find out the details in your location. If your town is included, an activity is planned or has concluded. If you are planning an activity, or you have a report on a completed activity and it is not yet on the list, email us with the details so they can be published. His Excellency the Governor General has kindly provided us with a message to be read at 2015 Boer War Day functions. It can be downloaded HERE. The Chief of the Defence Force has kindly provided us with a message to be read at 2015 Boer War Day functions. It can be downloaded HERE. The 31st May is the anniversary of the signing of the Treaty of Vereeniging that ended the South African War in 1902. Boer War Day itself is held on the Sunday before 31st May or near thereto to enable working people to attend. Some cities and towns may choose celebrate Boer War Day on another day near 31st May to suit their circumstances. Our annual service was held on Sunday 31 May 2015 at 1100 at the Boer War monument on the corner of North Terrace and King William Street in the city. Our theme this year is Fathers of the Anzacs. Following the official tributes Boer War Descendants and Friends had an opportunity to lay their own personal tributes. All former and present servicemen and women are invited to wear their service medals. Descendants are invited to wear their ancestor's medals on the right chest. All registered Descendants and Friends did receive official invitations. The service is open to the public and children are also welcome to attend. Enquiries to: 08 8662 4085. A report on the service will be available here in the fullness of time. Under a sunny, warm sky the Boer War Day 2015 commemorate service was held adjacent to the Boer War Memorial in Anzac Square, in Brisbane's CBD with some 70 guests in attendance. A Lance Guard was provided by 2/14 Light Horse Regiment (QMI), with logistic support from members of the Sherwood-Indooroopilly RSL Sub-Branch led by Kevin Alcock (President). 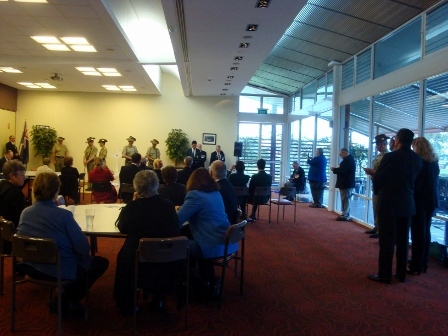 Brisbane City Council, which is always very supportive of our annual service, provided chairs and a PA system. The acting CO of 2/14 LHR (QMI), MAJ Tim Stewart, accepted a hand-written letter from the Boer War from Mr Allan Lilley. The letter, advising of the death in action of Pvt William Lilley, had been with the Lilley family since it was received in 1902. It will be preserved and displayed in the Regimental Museum (Army Museum South East Queensland). 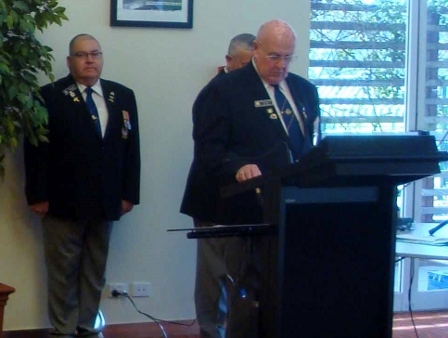 The MC was Ron McElwaine (Qld Committee Chairman) with the address on "Fathers of the Anzacs" being given by Bill Cross (Qld Committee Secretary) and enthusiastic support was provided by the BWM Qld Committee. The MC invited all to attend the BWM Qld presentation of "The Fathers of the Anzacs" at 2.00pm on Sunday 27 September at Sherwood-Indooroopilly RSL Sub-Branch. CLICK HERE to download the Order of Service. A Last Post Ceremony was held at the AWM on Thursday 12 February 2015 to commemorate the service of Lieutenant James Charles Roberts of the Victorian Mounted Rifles who was killed in action at Rennsburg on 13th February 1900. He was by all accounts a remarkable young man whose death in battle was a great loss to his family and nation. That week marked two significant Boer War Anniversaries which were the 115th Anniversary of Pink Hill and also the Battle of Paaredeburg. This battle is of significance to Lieutenant Robert's story was carefully chosen after consultation with the AWM to represent both these anniversaries. Paaredburg is also of great significance to Canada and is known as 'The First Remembrance Day' in the Royal Canadian Regiment, a distinguished allied regiment. A large audience numbering over two hundred people attended the ceremony and a wreath was laid by members of the ACT NBWMA Committee. The participants and onlookers consisted of schoolchildren, descendants and many visitors to this national shrine. Mr Ian Ball and Mr Colin Simpson attended and laid a wreath at the Annual Nurses and Midwives Commemorative Service at the AWM on Tuesday 12 May 2015. This was to represent the ACT NBWM Committee and to particularly remember Sister Fanny Hines (3rd Victorian Contingent) who was the first Australian service woman to die on active service. This is now a regular event for the ACT NBWMA Committee and was attended by approximately a hundred people. It is now an annual event on the ACT NBWMA calendar. 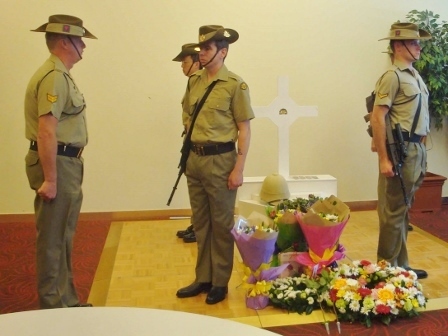 On Saturday 30 May 2015 at 1400, the Reverend Paul Black and the ACT NBWMA Committee conducted the fourth yearly commemorative service at the Saint John the Baptist Anglican Church, Reid which is located directly behind the NBWM site on ANZAC Parade. It is also to specifically remember two local volunteers who are commemorated at this historic church - Sergeant William Bradshaw Galliard Smith of the 2nd Scottish Horse who was the second son of the Reverend Pierce Galliard Smith MA, Minister of St John the Baptist's Church for thirty -one years. He was killed heroically at the Battle of Brakenlaagte on 30 October 1901 and Private William Frederik Young of the 1st Australian Horse who died of disease at St Vincent's Hospital Sydney. He had been wounded in South Africa and contracted enteric fever. Mr Robert Howse, a direct descendent of Major General Sir Neville Reginald Howse VC, KCB , KCMG read the Boer War Day 2015 Message from His Excellency General the Honorable Sir Peter Cosgrove AK, MC (Retired). Dr Joe Johnson CSC, AAM, RFD, ED, Deputy Chairman of the ACT Branch of the NBWMA was the Master of Ceremonies and gave a welcome address to those attending whose numbers increase year by year. Mr Phillip Chalker, President of the Australian Light Horse Association again attended in period uniform and while mounted greeted those attending at the entrance to the church which provided a great period atmosphere and was a fitting tribute to the many Australian contingents of whom the majority served as mounted infantry in this hard fought war. He also read Ecclesiastics 3 during the service which resonated with all present as applicable to all wars - 'A time to kill, and a time to heal; a time to break down, and a time to build up'. Ms Gai Brodtmann MP, Member for Canberra gave a moving commemorative address which focused on Pte Frederik Young's service in the South African War which ultimately was to cost him his young life. Warrant Officer David Hooper, Squadron Sergeant Major of B Squadron, 1st/15th Royal New South Wales read the Boer war Day Message 2015 from Air Chief Marshal Mark Binskin AC, Chief of the Australian Defence Force. Mr Carlo Vlok, Chairperson of the South African Military Veterans of Australia (SAMVOA) ACT Branch read the 23rd Psalm which is the official Psalm of the Australian Army and Dr JV Johnson who is also the Chairperson of the ACT Reserve Forces Day Council movingly read 'Lichtenberg' written by Rudyard Kipling. During the Service and at the graveside Mr Geoffrey Williams of the Queanbeyan Pipes and Drums played the bagpipes and the haunting music of the pipes bought the past alive during a moving ceremony. An increased number of descendants attended this year including Lieutenant Colonel Peter Tedder (Retired), a descendant of Lieutenant James Tedder of the Second New South Wales Mounted Rifles, Mrs Adrienne Bradley, a direct descendant of Sergeant William Bradshaw Galliard Smith. Mrs Betsey Boundy, the daughter of Sergeant Henry Clifton Prosser, Fourth South Australian Imperial Bushmen was present and she is a parishioner of Saint John the Baptist Anglican Church. Mrs Trish Barnes and her mother Mrs Joyce Greenway also attended being the descendents of Trooper Ashley Whitney of the then New South Wales Lancers. Representatives of the South African Military Veterans of Australia (SAMVOA) ACT Branch attended for the second time and were most welcome. They laid a wreath to commemorate the many South Africans who made the supreme sacrifice on whatever side they served with commitment and great gallantry from 1899-1902. Floral arrangements and wreaths were laid on both the altar of the church and on the grave of Private William Frederik Young to "To praise what is lost - makes the remembrance dear". An enjoyable afternoon tea was held at the Parish meeting room after the service which produced many interesting anecdotes from the descendants present about the service of their ancestors in the South African War. Clarence Town ANZAC Committee held our Boer War Service on Sunday 31st May 2015. Due to rain we were forced indoors so it was held at the Clarence Town Bowling, Sport and Recreation Club. Our Bugler is Zac Van Camp who has been playing his bugle for us at all of our commemoration services since 2007 when he was a teenager. In 2012, Eric Jennison, a local and a former NASHO in 1954, who then joined the Citizens Military Forces, presented Zac with a very special Bugle, which is the one Zac has played every year since receiving it. The bugle is believed to be over 150 years old. Many years ago Eric Purchased the Bugle at an Army disposal store and it had been sitting in a drawer for many years. Eric said in an interview in 2012..."I was sort of self taught on the bugle. A few of my mates and I would get together and give it a go. I was never very good but when we got together I would get it out and we would all make a bit of a racket. I got listening to Zac Van Camp and thought that he would like it". Zac said he was honoured when Eric gave him the Bugle. Hobart Sunday 7 June 2015. 12 noon. Boer War Memorial, Hobart Domain (near Aquatic Centre). There will be an opportunity for anyone to lay flowers or a posy on the day in memory of one or all who served. Launceston Sunday 14 June 2015 12 noon. Boer War Memorial, City Park, Launceston. Held at the Transvaal Fountain and Boer War Memorial Wall in Maitland Park. Morning Tea served at 10:30am to 10:55am. Even the forecast terrible weather held back its worst to encourage a strong attendance of over 500 at the Melbourne Shrine of Remembrance Service on Sunday 31st May. The Rats of Tobruk Pipes and Drums and ten mounted troopers from the Creswick Light Horse led the march of Distinguished Guests, descendants, Scouts and Guides up to the Eternal Flame for the Service. 202 Scouts and Guides attended in uniform, some bussing in from Ballarat, Bendigo and Geelong. Descendants of Boer War veterans gathered in Melbourne and throughout the nation yesterday to commemorate the 113th anniversary of end of the nation's first conflict. At least 16,000 Australians volunteered to fight for Britain against Dutch-Afrikaner, or Boer settlers in South Africa from 1899 to 1902 and, with some 600-1000 casualties, the conflict remains Australia's third-worst in terms of deaths. Governor-General Sir Peter Cosgrove said with Federation in 1901, it was Australia's first war as a nation. "Their knowledge of the bush, their riding ability, exceptional shooting skills and the medical attention they provided earned them universal respect, and their loyalty to each other forged the sense of solidarity that lives with our soldiers to this day," Sir Peter said. "In a difficult war far from home, our Boer War veterans showed what it was to be Australian. In this Anzac centenary year, their deeds are as important and relevant as ever and they are widely regarded as the fathers of the Anzacs, with many from the Boer War going on to serve in World War 1." Speaking at the Shrine of Remembrance, 2013 Australian of the Year Ita Buttrose said it was time to finally recognise those who served in the Boer War - with 15 per cent of the Anzac landing force at Gallipoli being South African campaign veterans. Ms Buttrose said the completion of a national Boer War memorial in Canberra should now be a priority and is expected to be completed by 2017. "The Boer War now remains the only major war in which Australians have fought not to be commemorated on Anzac Parade," she said. CLICK HERE to download the full text of Ms Buttrose address. May 31 marks the anniversary of the signing of the Treaty of Vereeniging that ended the war in 1902. Our annual commemorative service was held on Friday 5 June 2015 at 1100 at the Mosman War Memorial. The National Boer War Memorial Assoc (NBWMA) theme this year was "Fathers of the Anzacs". 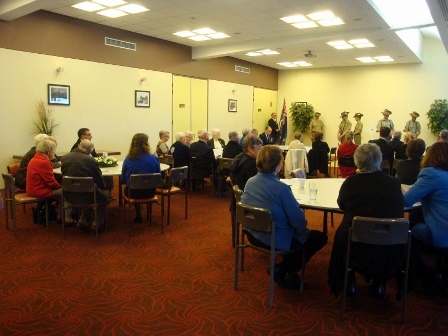 The service was conducted by the RSL Mosman Sub-Branch and its President Lt Col Ian Henderson (Retd) was the Master of Ceremonies. Capt Duncan Spencer (Retd) read the Prologue; Lest we forget the Boer War which was the address given by Dr Craig Wilcox on 7 April 2010 at the launch of the NBWMA International Design Competition for the Boer War Memorial, Canberra. Lt Col Peter Reid (Retd) read the Rudyard poem, Lichtenberg and explained its background. Rev Dr Max Wood, Rector St. Luke's Anglican Church said the Prayers and gave the Benediction. Rev Mons Eugene Harley OAM, our chaplain of many years, is no longer able to participate in this service. Lt Col Ian Guild MBE (Retd) delivered the Commemorative Address. He spoke of the hardship experienced by our Australians in this war and what it meant to our young nation. He appealed to all to support the construction of the National Boer War Memorial in Anzac Parade, Canberra. Cr Roy Bendall read the Commemoration of the Fallen which was followed by the laying of many beautiful wreaths. After the Ode and Last Post, the Closing Remarks were made by Lt Col Tony Larnach-Jones (Retd). He described how our experiences in the Boer War better prepared our new nation and its soldiers for world War I. The Boer War veterans were the Fathers of the Anzacs. There was a Boer War Commemoration and Reconciliation Service at the South African War Memorial on 31 May 2015 in the presence of Her Excellency the Honourable Kerry Sanderson AO, Governor of Western Australia. The service will commence at 1100 with the mounting of a catafalque party. Perth's Boer War memorial is located on Fraser Avenue in Kings Park, close to the main entrance. It is the oldest war memorial located in Kings Park. CLICK HERE to download the Premier of Western Australia's message. Brian Ross spoke of the reconciliation between the descendants of those who were fighting for their way of life, and those on an empirical adventure. "As ek aan die verlede herinner onthou ek die Oranje Vrystaat - 'n plek waar ek net soos my ouers geboere is. Langenhoven se geliefde woorde 'Deur ons vêr verlate vlaktes' praat direk met my van ons land. When I recall the past I remember the Orange Free State where I, like my parents, was born. The poetic words of Langenhoven speak to me of our land. Today we all remember the many thousands of women and children who died in British Concentration Camps. We weep at past savagery that saw farm houses burned down and countless cattle and sheep killed to win a war by destroying an economy. That is now long past! My grandfather Commandant George Walter Ross signed the Peace Treaty of Vereeniging on this day in 1902. At last it established peace for the people of his district and country. This peace led finally to a united country of two republics and two colonies. My grandfather fought to defend a country that welcomed him as a new settler, where he succeeded in business. The new country benefitted my family. My mother was the first woman to graduate from the University College of the Orange Free State. The growing family business was able to spread into the neighbouring province of Natal. In the First World War one of my uncles, Claude, died serving with the Royal Flying Corps. In 1916 my father rode into German South West Africa with the Natal Carbineers. At the end of the first world war the League of Nations gave South Africa custody of what today is Namibia. Now we are Reconciled. We Remember." On Sunday 31st May members of the Port Hedland RSL Sub branch gathered at the Port Hedland War Memorial at 1100 hrs. Following the Flag and Wreath laying ceremony the President Mr Val Middleton gave a short talk. At the conclusion of these events members adjourned for a light lunch. Our annual service was held on Sunday 31 May 2015 at 1100 at the ANZAC Memorial, Hyde Park South. Sydney. Our theme this year is Fathers of the Anzacs. CLICK HERE to download Order of Service. There was a small wreath laying ceremony held at the Wollongong Cenotaph at 11 am on Sunday 31st May. There was no official ceremony organised by the RSL in the Illawarra area and I joined with a National Serviceman's contingent that were commemorating Boer War Day at the Wollongong Cenotaph. Three of us were descendants and we conducted a service. I am disappointed that I could not find any organised RSL ceremonies commemorating Boer Day. I was pleased to find the small group planning their own ceremony. I presented a short speech to those present regarding my paternal grandfather and his brother who were a part of the Second Lancers contingent under Cpl Harkus that sailed in January 1900 and my maternal grandfather who served with NSW Mounted Rifles. I also indicated I would attempt to generate more interest in this un-official gathering at next year's Boer War Day.